In the following examples, it is assumed that a job board offers both models and the click model has the same quality. Length of time is the classic model. The job ad is advertised for 30 days. During this time, the ad will be refreshed twice and ranked # 1 in a search list. There is no promise of visibility or clicks. The costs for the campaign are usually the same throughout the year. This means you have to pay the same amount in the summer months when there are fewer applications than in the other months, even if you are not looking to fill as many jobs at that time. Length of time models are always exciting if you expect a lot of clicks on the ad. In the best case, you should expect more clicks than with a click-based model, because you have a higher risk factor. The click-based model (cost-per-click) is a more novel variant. In this model, you only pay for clicks, for example, a click of a visitor to a job advertisement costs 1.50 EUR. You can choose to take the ad offline when it reaches a certain amount. If you were able to fill the position early, the ad can be removed early, so you only pay for the clicks that have been made and not a fixed amount. Click-based models are always interesting if you want to reduce risk. You have a lower risk factor, because you only have to pay the actual clicks. The click price is usually stable. Therefore, you will not benefit, as compared to the length of time model, if you get a particularly large number of clicks. However, you should not immediately assume that the click-based model is better. First, you should ask questions about the clicks for a more realistic comparison. - Is the click from a human? Bots and crawlers can also generate clicks. - Is the click from my region? - Is it a mistake click that a candidate made accidentally? To find out, you need to know the click path. 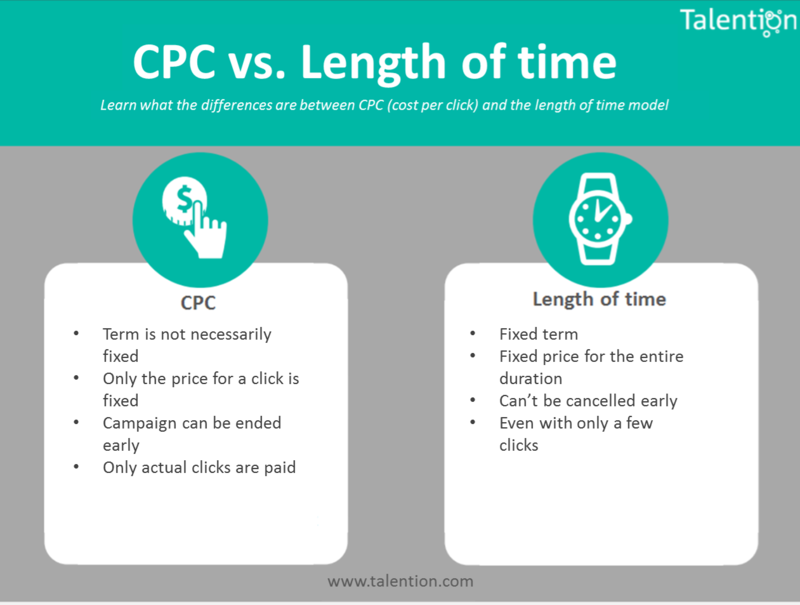 If you choose a length of time model, you should be sure that you will get more clicks than with any other model, so it's worth the higher, fixed price and risk to you. If you do not want to take this risk or have already had bad experiences, the click-based model is recommended for you. Here you can control the costs and run ads during the summer period without the danger of spending too much of the budget for just a few clicks. In general it is important in recruiting to keep track of clicks, incoming applications and budget spent. Only then can you spend your budget on the right and promising channels. A modern recruiting software offers you all the essential components for a clear, transparent process. We would be happy to show you what this might look like in your case in a personal conversation. You can request a free demo here.